For enjoying water puppet show in Quang Ninh, you may come to Royal Park in Ha Long City or Yen Duc Village in Dong Trieu District. Royal Park is located in the center of Ha Long City. It takes you not to much time for coming here. So you may have the time for walking to enjoy the atmosphere in beach city and then enjoy the great moment in the theater to experience the traditional and special water puppet show. The theater in Royal Park has its capacity of 300 seats. There are 3 shows in the evening with the duration for half an hour. Compared with the theater in Royal Park for water puppet show, the show in Dong Trieu District is not arranged in the stable schedule. 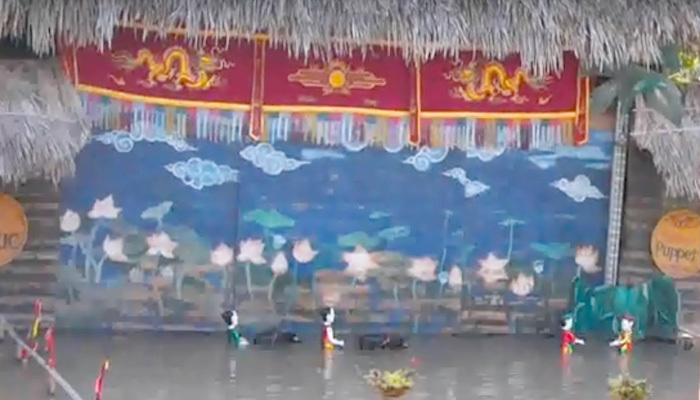 The water puppet show in Dong Trieu District is performed by local people who are not professional artists like the artist in Royal Park. In Dong Trieu, the area where the show takes place is also different from professional theater in Royal Park. The show happens in the context of the village where the audiences can feel the peaceful scenes from the countryside. From this reason, the water puppet show in Dong Trieu is held for the group of audiences who are visitors travelling to the district. Or some group of audiences who love to enjoy the natural scenes from the countryside in the time enjoying water puppet show. Ha Long City and Quang Ninh in general is the wonderful place for exploring in the Vietnam tours, especially tour in the North. 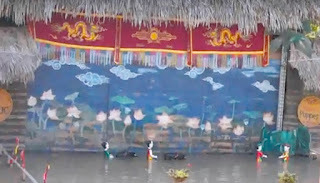 Water puppet show in this area is an effective element which contribute the tour here to be more impressive. The shows is considered the gentle spiritual taste to visitors. It brings to audiences the memorable moment and some interesting experience related to cultural feature and art.